Dallas police say they are not looking for suspects in the Tuesday morning shooting death of a man on Interstate 45. Officers were called at about 4 a.m. to the 9200 block of Julius Schepps Freeway, where a man was found shot inside a pickup truck that had crashed. The man, who has not been identified, was taken to Baylor Medical Center and pronounced deceased. Officers closed the southbound lanes of I-45 at Simpson Stuart Road for several hours as police investigated. 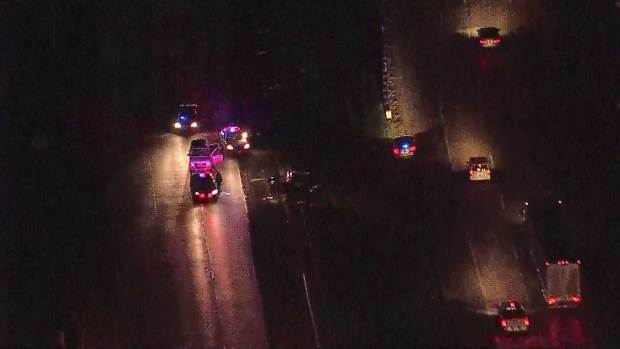 A portion of Interstate 45 in Dallas County is closed Tuesday morning as police investigate a shooting there. Police later said the incident was being investigated as an unexplained death and no suspects are believed to have been involved. Check back for the latest on this developing story.